Today is February 29, 2008. 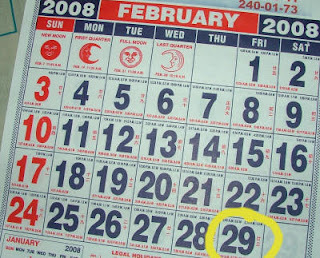 It only occurs every four years during leap year when there is a Feb. 29. I really didn't take notice to this day as an extraordinary day. February is unique in a way that it is the only month with 28 days. It's uniqueness extends to the fact that every leap year, it's the only month with 29 days. All the other months have either 30 or 31 days which doesn't make them much spectacular in that manner. Today, I also get to celebrate my monthsary with my sweetie. Yes, it falls on the 29th. And so, suddenly Feb. 29 has meaning since we won't be able to celebrate it for the next 3 years. Now I realize that there must be people whose birthdays or anniversaries and important occasions fall on the 29th of February. They must have to settle to celebrate on March 1, or a day earlier on February 28. Either case, leap year now has meaning for me. Happy leap year ! Just thouht I would stop by and say hello. I am in Houston Texas. I lived in San Fernando LaUnion for 2 and 1/2 years. I miss it. I was in the Air Force and married a Filipina 29 years ago and still married.